Vogue 8082 is out of print now, but I’m reviewing it anyway since I used this pattern to make a skirt for my mom for Christmas. I made view C (the green one in the picture here). 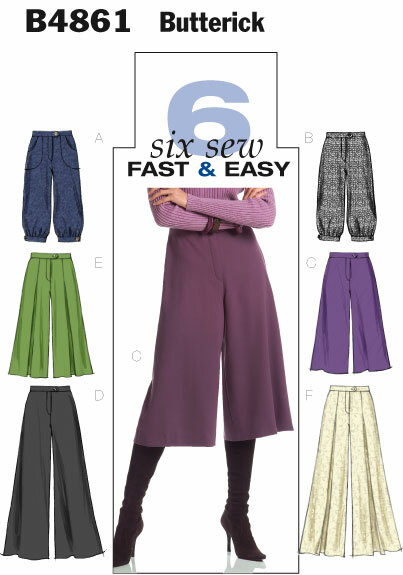 Pattern Description: Below mid-knee, flared skirt has layers and side zipper closure. A, B: waistband with tie end. C: gathers on front and back yokes. Pattern comes in sizes 6 – 20 I believe; I think I cut a 14 or a 16 and made minor adjustments for fit. Were the instructions easy to follow? Yes, but to be honest once I’d read them through a couple of times I set them aside and sewed the thing mostly by common sense. Which I suppose speaks well of the design. Or me. Who knows. What did you particularly like or dislike about the pattern? It’s a fun style, very flirty and it has a lot of movement in the finished garment. It took a LOT of fabric (4 1/2 yards for a knee length skirt!!) and a lot of time because of all the layers. I was reeeeeally ready to be done hemming by the time I’d gotten through them all. a>Fabric Used: 100% rayon Batik in a brightly colored leaf print. Pattern Alterations or any design changes you made: I adjusted the fit a bit in the waist. I also ended up gathering the yoke more than the pattern called for. The original pattern had two lines of long stitches in the front and two in the back to gather the yoke. I found that the space between them was too great and at the center front and center back the small gathers fell into a poofy mess instead. I don’t know if that’s because of the fabric I used (on the list of recommended fabrics on the pattern envelope) or just the design of the thing. In any event, I stitched a few extra places and I’m happy with the result. Would you sew it again? Would you recommend it to others? Yep. Conclusion: This is a fun skirt to wear with all those flouncy layers and my mom was quite pleased! I expect I’ll also make her another one in the view B at some point. My mom requested “a nice black top” to accompany a skirt I plan to make for her soon. Since I had fabric on hand and a good base pattern for a shirt to fit her (and did not yet have the waist and hip measurements I needed to draft her skirt pattern) the top came first. This is the same pattern I’ve used for the last four shirts for her, in a sleek black 4-way stretch fabric. Flutter sleeves seemed right for the top to match the upcoming skirt… but I have never made them before, or seen what patterns for flutter sleeves look like. Couldn’t find it online anywhere either. So, I guessed! Just tried to picture in my head what it would look like to unwrap that three dimensional shape into the two dimensional fabric piece that would be needed… and it turned out fairly well, don’t you think? (Although not quite perfect). No beads on this one – I glued sizable rhinestones all along the neckline for some bling! Mom’s pleased and plans to wear it out soon. My bra making efforts are on hold at the moment while I wait for my supply order to arrive (it shipped today), but I am continuing to create items to expand my mom’s wardrobe. We recently purchased a stockpile of fabrics on sale from fabric.com, and I’m working my way through them little by little. Today’s achievements made use of a bright royal blue poly knit fabric. I used the same pattern we created for her purple beaded shirt, and had enough fabric leftover to make a sleeveless tank as well. Since I used basically the same pattern for both shirts, and identical fabric, I did a couple of simple things to help make them look a bit different from each other. The long sleeved shirt has a scoop neck, a self fabric neckband, and beadwork along the neckline. 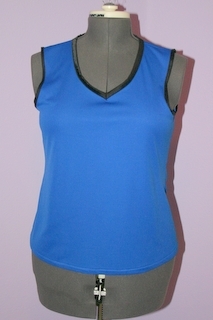 Meanwhile, the tank is sleeveless with a V neck, and has contrasting black fabric at the neckline and along the arm holes. And Mom, if you’re reading this, your silver shirt will come soon but it turns out I don’t still have that fabric on hand. I added it to my rapidly growing list for a trip to the fabric store soon!